So there I was, on the brink of turning 40, (heard that was a milestone of sorts for most people – mid-life crisis, anyone? 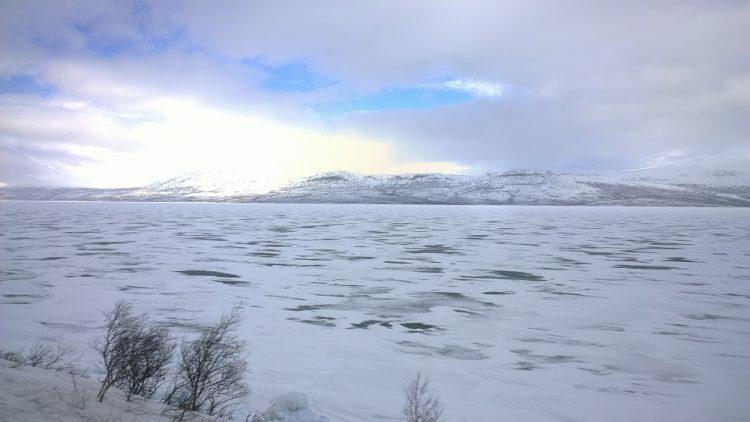 ), staring at a frozen landscape, miles and miles of pristine white, not a single soul to be seen, save for my darling hubby (and a couple of curious moose on their daily stroll), the vast expanse like nothing I had ever seen before and…it felt good. (I might have just been inspired enough to whip out a yoga mat and meditate, but suppose then my arse might get frozen stuck onto the ground so no go on that). So the moment came and went, the supposedly momentous moment, a warm kiss from my beloved, a couple of crazy selfies and a mid-afternoon viewing of the aurora borealis. Not. Speaking of the aurora, the haunting spectacle of ghoulish green lights that dance and enchant humans of the northerly hemisphere, (and penguins of the southerly hemisphere), well, Ms Aurora decided to elude us the 3 days we had crossed over into the Arctic Circle. This was sometime towards end of March 2014, and plain bad luck, it was cloudy the 3 days we were there, but of course, the day before we had arrived, we were told there was a technicolour, disco-ball worthy lights dance show. Oh well, it can’t always be rainbows and unicorns, can it? 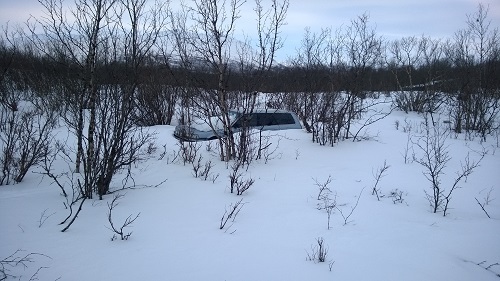 But, no matter – the highlight of the arctic circle sojourn was yet to be. 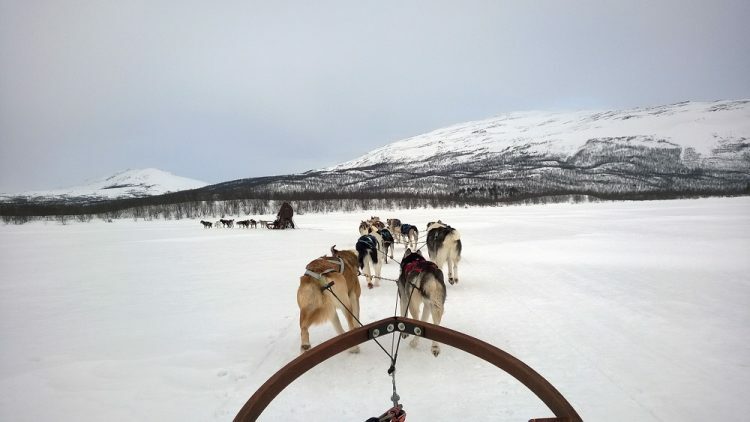 Well, until a bunch a stir-crazy huskies started pulling us, devilishly fast across the dazzling landscape – the pre-run howls replaced by the whoosh of the gorgeous snowy dogs racing across the snow. It may not be a peekaboo light show, but I’m going to bet you every last dollar in my account, (yes, all $1,432 of it) that this is the single most enchanting moment of being up in the arctic circle. Ok, well, if you love dogs and don’t mind the occasional fart in your face. No no, that didn’t happen to me, Abisko dogs don’t do that okay, but I heard this happens elsewhere. 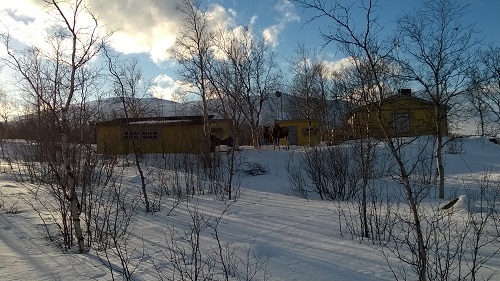 I’ll tell you what made this THE highlight of Abisko – the fact that these dogs were in their element. I thought all this while that husky sled rides were something the poor doggies were forced to do, dragging a bunch of tourists around for long distances, nary stopping for a bite, but the way I saw the dogs excitedly barking and pushing forward, and also the way their mushers here treated them with such care as if they were their own babies (which I heard is the case, as they bring them up from when they were puppies, observing their every move so they know who is the brains and who is the brawn), and the massive post-run treat that the doggies received, I knew that this was okay. They love to run with their pack, they love to pull and they love the cold. (As opposed to the many huskies I see despondently sweltering around in the heat of Singapore). 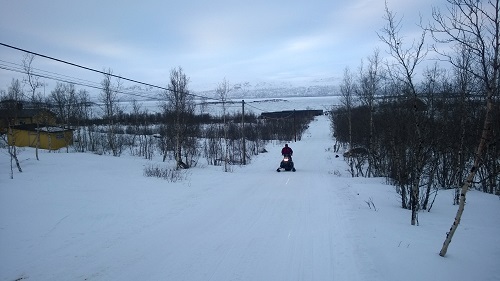 Now, of course, you could eschew the doggies and ride around in another extremely noisy animal, also known as the snowmobile, but I wanted to give the roar and the petrol fumes a miss – plus I couldn’t get the nightmare of the skidoo crashing through the cracks of a thinning frozen lake and plunging me into ice-cold waters out of my head. Not saying that that happens usually, but…I guess that’s the soft, city girl in me, rearing my scaredy cat, rebonded head. 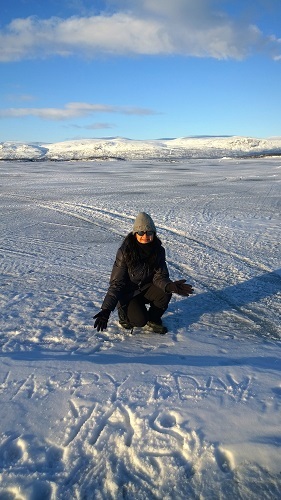 The city girl did make it to the Snowshoe Trek under the non-existent Northern Lights tour though. We were given a quick how to walk with snowshoes tutorial without falling on your arse, and off we went into the chilly night with our incredibly fit and affable guide. All I can say is, if you need to warm up in a hurry, do a trek uphill – must have been getting a good cardio workout as it started getting toasty enough for me to start unzipping as we ascended the hills but of course, once we stood still waiting for signs of the lights, the cold crept right back in. Still, it was really (literally) a breath-taking experience. 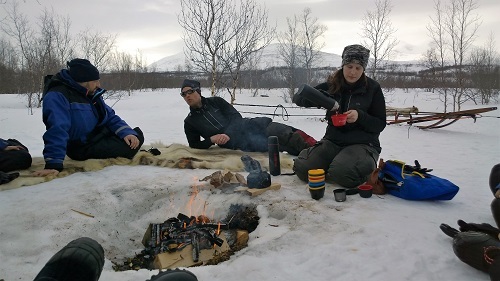 Next up, part 2 of my Abisko adventures where I’ll share more on the Abisko Mountain Lodge and tips overall for this trip. You might also be interested in my Reykjavik writeup, where I did see the Northern Lights in the end!